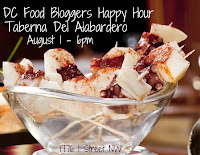 Food and Wine Bloggers from the greater Washington DC area met on August 1, 2012 at Taberna del Alabardero in Washington DC for a DC Food Bloggers Happy Hour. This was quite an event. 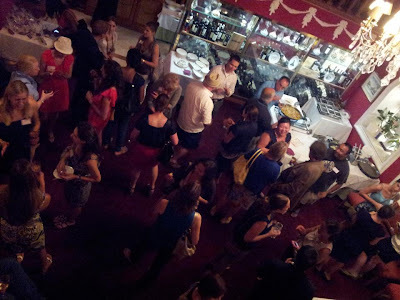 We were about 30 food and wine lovers, enjoying Spanish wines, including Sangria, and the food prepared by Chef Javier Romero, including two different kinds of Paella. In addition to the superb menu and wine list, the decor is impressive and almost screams you will be treated like royalty. The happy hour took place in one of the private rooms that feature dark walls, gold embellishments and a pretty chandelier. Chef Javier Romero who came directly from Madrid heads the team in the kitchen. I like in particular the winemaker dinners at Taberna del Alabardero and have attended two of these lately. 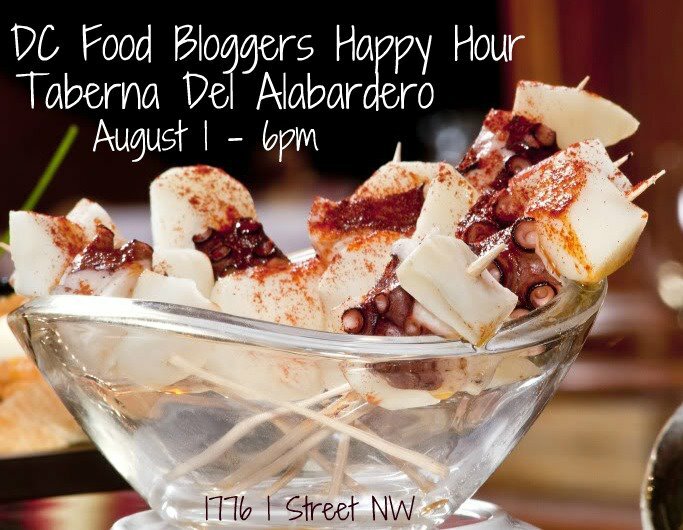 The winemaker dinners typically take place in the same room where the DC Food Bloggers Happy Hour took place. From there, you have a superb view of what is going on in the kitchen. I have made many pictures of Chef Javier Romero and his team and have focused on him in a recent posting. The food Chef Javier Romero prepared for us was superb, as always. It is not only the wine which matters most when selecting and enjoying with friends but the whole decor ,environment and gorgeous presence also matters most. Wine Chillers add so much to the enjoyment of wine. Great post and pictures are amazing ,high quality and truly showing the decor and real inside beauty . Such a fun event! Sorry I didn't get a chance to say hi to you in person.